When I was younger, eating seasonally didn’t have much meaning to me. I had little connection to seasonal eating save picking berries in the summers and making pumpkin pie every Thanksgiving. When I stepped away from processed foods, I naturally began to eat more seasonally because I made my foods from scratch, out of fresh, whole foods. In the colder months, I delight in seeing foods like sunchokes, cranberries, and the many varieties of apples appear in the market. I look forward to the berries and rhubarb in springtime, zucchini in the summer, and figs in late summer. There’s no time to mourn a passing season because for every fruit or vegetable going out of season, there are many whose seasons are just beginning. I was just beginning to fall in love with real, whole foods. At the time, I was reading a lot of food blogs (vegan and not) to fuel ideas for my new and vibrant diet. 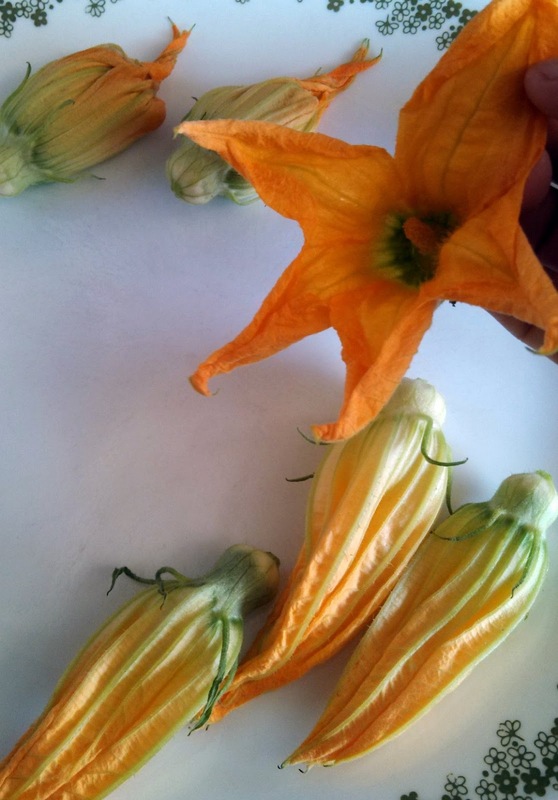 Many of them were singing the praises of zucchini blossoms. I was interested in them, but wasn’t sure where to find them or when. 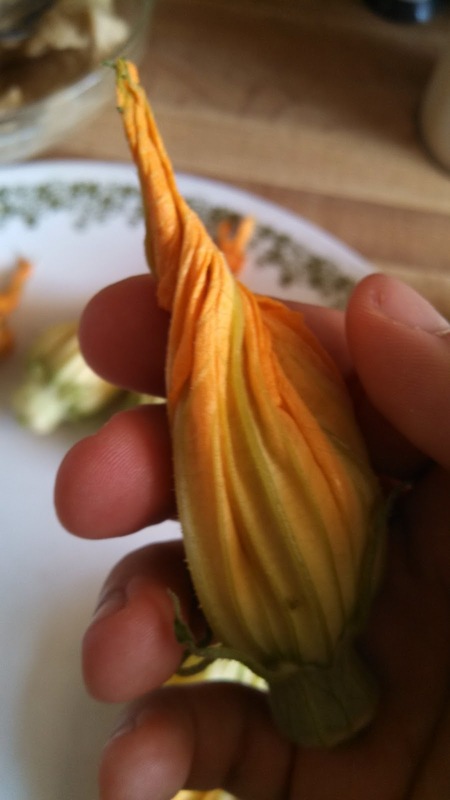 A few weeks into my squash blossom intrigue, I stumbled upon them at a local store. Even though they were a little bit expensive, I eagerly bought 2 containers. 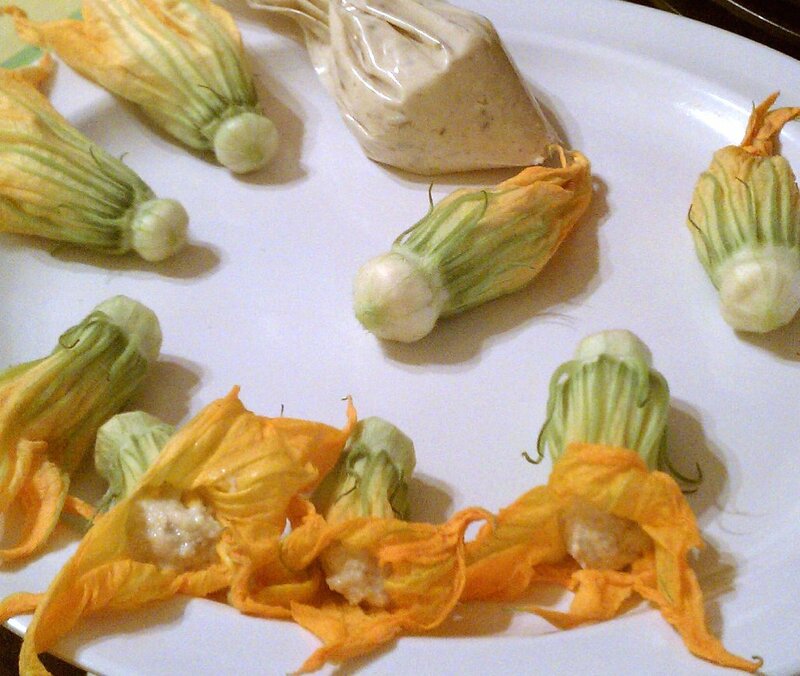 Most of the aforementioned blogs prepared the blossoms by stuffing them with cheese and frying them. So I had an idea, but one which also posed a problem. I made a killer tofu ricotta that would have been great, but I was eschewing soy at the time. I also knew that cashews made an incredibly luscious cheese (thank you, crepes from Vegan Brunch for introducing me to the wonder that is cashew cheese), but I was avoiding cashews, too. They have a high mold content and anyone sensitive to mold may react to cashews. Who knew?! At the time, I wasn’t digesting very many nuts and seeds well, but one of them that I had no problems with was sunflower seeds. Lightbulb! This cheese here is the very first seed cheese I ever made. It is really intense on its own, but is delectable when stuffed into a bright and beautiful zucchini blossom. You will most likely have some left over. We ate our remaining cheese with roasted broccoli, but you could serve it with some crackers, add it to a plate of raw zucchini noodles with marinara sauce, or even use it as a filling or spread for a collard wrap or veggie burger. It’s a fairly versatile recipe, so switch it up! It’s important not to be overly restrictive with diet, but it’s equally important to have dietary standards based on your desired level of health. Know your boundaries. I am not one to fry things or saturate everything I eat with oil. My oil usage is scant, but I don’t exclude it from my diet altogether. Instead, I use healthy oils minimally at home and steer clear of fried and oily foods when I dine out. That way, I can control how much is used and how it is prepared. There’s nothing worse than beautiful vegetables that have been ruined by rancid vegetable oils that were heated beyond their smoke point. Ok, ok. There are many worse things, but it’s still pretty gross. Since I live with someone who eats anything as long as it’s vegan, I sometimes bend my diet to meet him in the middle. This is one of the few things that I eat that is fried. As long as I don’t eat a boatload of them, my level of health does not waver. And realistically, eating fried squash blossoms two times in the last three years is not going to hurt my healing goals. Although this is a fried recipe, these would be wonderful uncooked as well. 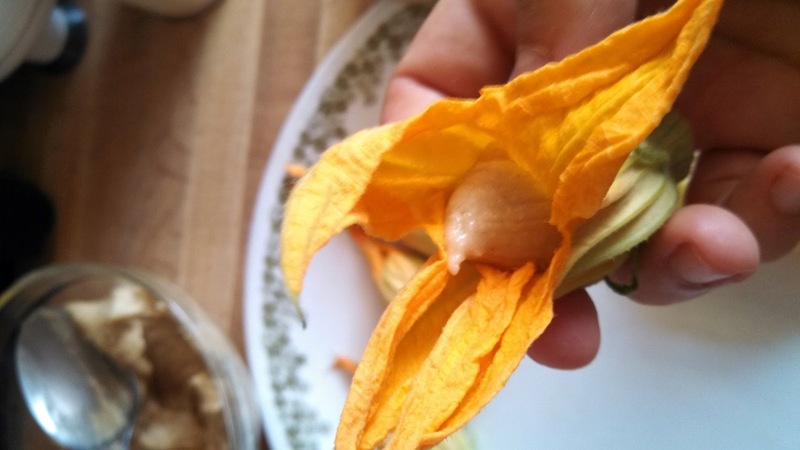 Additionally, if you have a dehydrator, here is an interesting take on raw “fried” blossoms. -Put all cheese ingredients except capers into a blender or food processor and blend until smooth. -Add in capers and pulse incorporate. -Transfer cheese into a pastry bag or a small ziplock bag*. -Gently separate the petals of the blossoms and pipe in the cheese. Fill the blossoms no further than the point that the petals separate from each other. -Grab the end of the petals and twist the blossom shut. Set blossoms aside. -For the batter, first prepare the flax egg. Then, in a medium-sized bowl, mix together the dry ingredients. Whisk the flax into the carbonated water. Pour the wet ingredients into the dry and mix. Set aside. -Heat up about 1/2 inch of coconut oil in a pan on medium high heat until hot enough to begin frying. -When the oil is hot enough, dip about 4-5 of the blossoms into the batter and place them into the pan. Don’t crowd the pan. Putting too many in the oil will lower the oil temperature and they won’t fry correctly. -Fry a few minutes until crispy and browned, then flip and cook the other side. -Place them on a plate covered with a paper towel to absorb some of the oil. *If you don’t have a pastry bag, you can use a ziplock bag. Spoon the cheese in and snip off the corner off the bag. Then you can pipe the filling out of the cut corner.